The Firebiner is all that, plus it has the ability to make fire easily with patent-pending EverSpark technology. It has a titanium coated stainless steel body: construction rated for a minimum of 50 pounds of gear (not for climbing or hanging anything with a beating heart). And, don’t forget the small utility blade. Outdoor Element even designed in a screwdriver tip. Disclosure: Outdoor Element contacted me with an offer to try one of their prototype Firebiners. It was provided at no cost to me. My only responsibility was an agreement to complete this review after trying the item. I was not pressured in any way to make a positive endorsement. The Firebiner is very easy to use. In fact, the most difficult thing about it may be getting it off the merchandising backer card. It is clipped on there tight. Seriously though, the screwdriver is strategically placed on the corner for ease of use. The bottle opener and utility blade are located in the same nook of the Firebiner opposite the gate. Multiple hang slots enable you to attach the Firebiner to a key chain or a hook on your backpack. The Everspark fire wheel seems to live up to its name. I used it two dozen times back to back, and it created a big spark each and every time. The safety gate is also quite easy to open so you can attach the Firebiner wherever you would like, then it is hinged so it automatically pops back closed, a nice touch. I did struggle some replacing the ferro rod for the spark wheel. It comes with a teeny tiny screwdriver to open the spring-loaded compartment that holds the rod. Getting the spring back in there and tightening the compartment screw definitely takes some practice. I might have said a cuss word or two. Please make sure you don’t try to use the Firebiner as a real carabiner for climbing or supporting your weight. 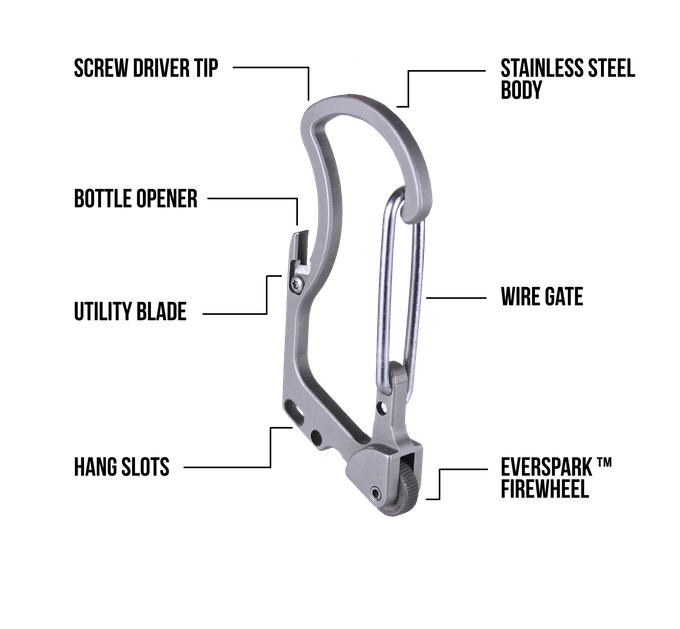 While it is rated up to 50 pounds, the Firebiner is designed to be a camping utility tool, not a climbing carabiner. I think this is a great idea and a useful tool. The Firebiner has already found a place clipped to my backpack. The Firebiner comes in four colors: black, silver, blue, and MTB (a multi-color). Until June 2017 you will need to pledge to the Firebiner Kickstarter campaign to obtain one. Or, you can pre-order from the Outdoor Element website. Beginning in late May-early June, the production Firebiner will be available for retail sale with a MSRP of US$14.99 from multiple outlets. I will update this post to include those outlets at that time.